Marginalised and disadvantaged communities, including indigenous and ethnic communities world over have poorer health outcomes and share similar experiences of exclusion in accessing health care. 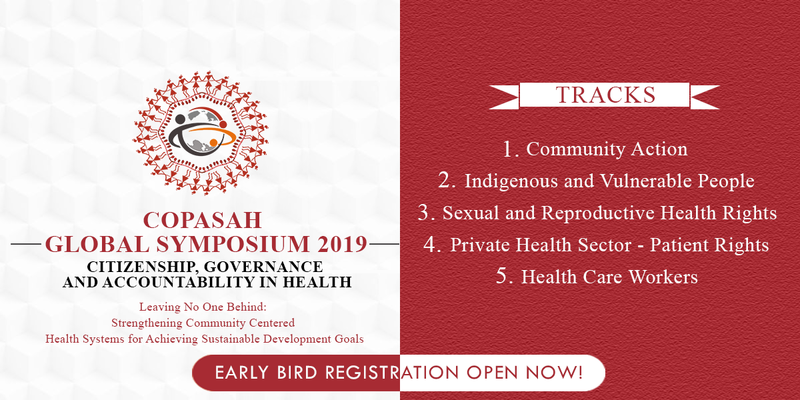 Based on COPASAH members’ experiences of working on social accountability processes to challenge power-inequities, a COPASAH organised session was held in the fifth Global Symposium on Health System Research (GSHSR) Liverpool, 2018 which explored possibilities of advancing a Theory of Change (ToC) towards Universal Health Coverage/Care (UHC) for adoption by the health systems. Health systems in diverse socio-political contexts of global south reflect the power and hegemonies they are embedded in, as experienced by the indigenous and other marginalised social groups. The indignity and vulnerability experienced in the face of insensitivity and unaccountability of the health care providers further perpetuates the cycle of discrimination and social exclusion in health care, further translating their vulnerability into human rights violations. This seriously impedes achieving the underlying goal of Health for All of Alma Ata Declaration, reflected both in Universal Health Coverage (UHC) and Sustainable Development Goals (SDG). COPASAH facilitated community centred social accountability processes which include, inter alia, human rights and legal accountability approaches, community based monitoring of health services, and use of information communication technologies, have enhanced the negotiating power of marginalised communities to demand accountability from the health care providers and policy makers. Even as the practitioners across Latin America, East-southern Africa, South-eastern Europe and South Asia, continue to face challenges, they have leveraged their collective power to negotiate as empowered communities for improved access, equitable and affordable access to comprehensive health care. The session aimed at stimulating critical thinking of participants drawn from civil society organisations, practitioners, participatory action researchers, policy-makers and funders of accountability projects The Chair, Prof. Lynn Freedman (Mailman School of Public Health, University of Columbia); introduced the objectives and design of the session and laid out the key ideas around the issue of social accountability in health. Prof Lynn also laid out the broad context of discussing social accountability in health. Aiming at advancing a theory of change that includes negotiating power through ‘community centred’ participatory and bottom-up social accountability processes, the session witnessed participation of nearly 48 participants from different nationalities. The session further involved panel discussion and presentations of country case studies representing experiences of social accountability processes from four diverse geo-political contexts of indigenous and other marginalised social groups. The panel discussion was moderated by Abhijit Das, Global Convener - COPASAH (India). The presentations included three from global south, i.e. South Asia (India) presented by Renu Khanna, East-Southern Africa presented by Dr. Aminu Magashe (Nigeria), and from Latin America presented by Ariel Frisancho (Peru), and one from South-Eastern Europe presented by Borjan Pavlovski (Macedonia). In addition to the case study presentations a mapping and analyzing of contexts, actors, processes/mechanisms/pathways, and outcomes/changes observed in social accountability processes in the health system was done. The presentations highlighted i)different health policy and rights/entitlement gaps that are identified and addressed ii)a detailed narrative of the processes and efforts done by the civil society to address such gaps and iii) outcomes, results and learnings from these efforts which were recommended to be adopted as measures towards achieving SDGs and UHC. Following the country case study presentations, a participatory discussion was facilitated by the chair of the session and a critical analysis on power asymmetries and negotiating power in health care through theoretical frameworks was done. The social accountability cannot be limited only to a few tools or events such as score cards or discussions. Social accountability centres on the power of citizens and communities to act. In more than one way, the power of citizens is expressed as power to demand, power to question, power to dissent and power to engage. Most of the health related programmes designing itself is top – down and non-participatory. The power to demand participation itself is a huge gain the process. Evidence emerging from engaging with the communities has a great potential of validating demands and leveraging citizenship. Social accountability in terms of galvanizing citizenship is a continuous process of engaging citizens with these issues, augmenting citizen and community voices.